Some time last year (or maybe the year before that) a friend gave me a set of crochet hooks that she didn’t want anymore. I’ve always found crochet to be a bit of a mystery and thought it would be a new and interesting way to clear some of the wool from the wool box. After about ten attempts at the “magic circle” I realised that actual magic may be required, lost my temper and hid the crochet hooks at the bottom of a drawer. Some amount of months went by. I left my job and milled around for the summer not really sure what to do with myself. It took a while, but finally I reached the point where I’d run out of ways to entertain myself and it was either get a job or give crochet one last chance. Obviously I chose crochet. Here are my creations. Shortly after I finished making them I started working again and the crochet hooks have returned to the bottom of the drawer. But at least I got past the cast on phase and could probably crochet something again if I really wanted to. 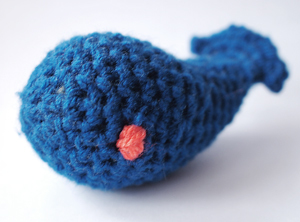 Tiny Whale pattern from Planet June. 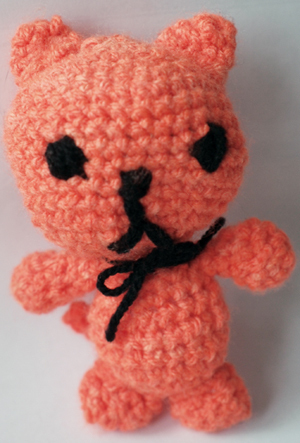 Little orange cat pattern and Minecraft Creeper pattern from Nerdigurumi. 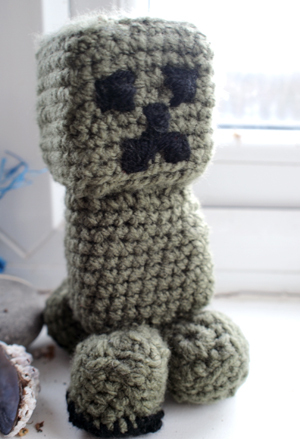 This entry was posted in Crochet and tagged boredom, creeper, crochet. cat, hooks, minecraft, nerd, whale. Bookmark the permalink.